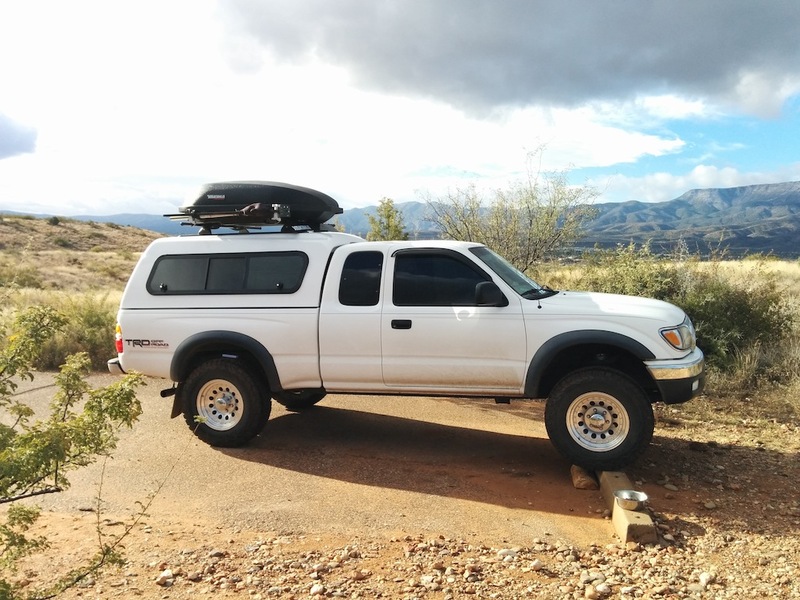 As well as the Tacoma is set-up for our needs and how comfortable we are on this nomadic adventure sometimes it’s nice to avail oneself to the simple luxuries in life. I’m talking about hot showers that didn’t come trickling out of a solar shower bag and potable water that didn’t need to be hand pumped through the MSR filter. To that end we decide to pay actual money to stay at a campsite. This will be the first and, so far, only time on this trip we’ve spent $ on a campsite. We head towards Cottonwood, AZ and the amusingly named (unless you’re a horse) Dead Horse Ranch State Park. After unpacking and getting situated we head over to the showers where we meet to camp hosts, a nice couple I find out later are from Florida but spend 6 months a year in this area doing the camp host gig. They are in the midst of cleaning both shower areas so… I’ll have to wait to scrape off the dirt for about 15 more minutes. We come back after the allotted time and are the first to use the freshly cleaned showers…bonus! I can easily leave Willow tied outside but the camp hosts take an instant shine to her (as do all who meet her) and offer to take her for a walk around the area as I shower. Very nice. Willow, as always, is up for an adventure with strangers and happily trots off at the side of her new friends. The showers are great for public showers. Nice, immediate hot water. No need for quarters and no button to push that only allows the water to flow for 30 seconds at a time. Fifteen minutes later I am showered, shaved and smelling nicer than my normal mammalian self. I collect Willow, thank the camp hosts and buy a bundle of wood from them since we’re not allowed to collect downed wood and there is not much around anyway. Back at the campsite I take my two Scepter water cans over to the communal campground faucet and fill them up, no hand pumping required. Since rain is in the forecast I parked the Tacoma up on the tire stops so that any water that leaks into my P.O.S. snugtop shell will roll away from my dual-battery system in the bed. I’ve since had the people I bought it from try to fix the issue and now it is better but still not great. I was expecting marvelous and instead got mediocre. The picnic table and fire ring are about 10 meters in front of the Tacoma, to the right in the picture above. 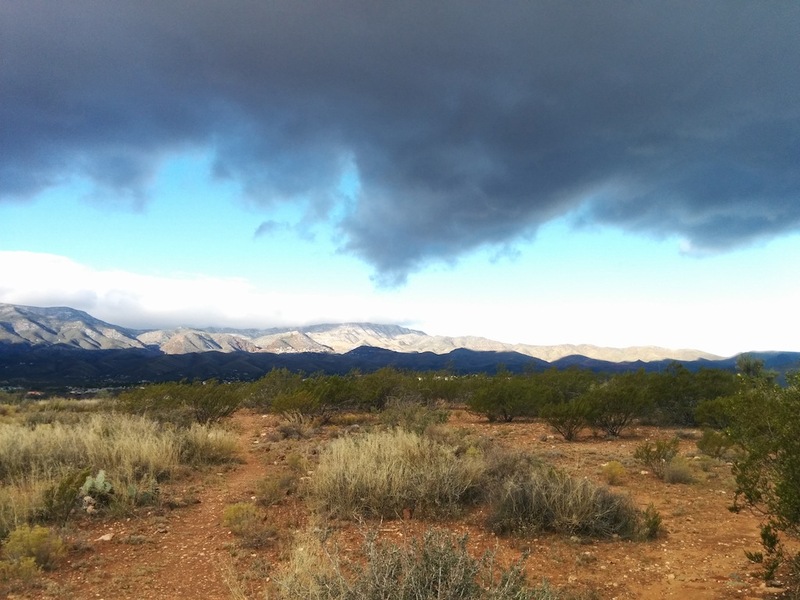 We start dinner, lay the wood for the fire which we will light at dusk and sit and relax and look out over the desert plain. Taken before nightfall. No twinkly lights, sorry. 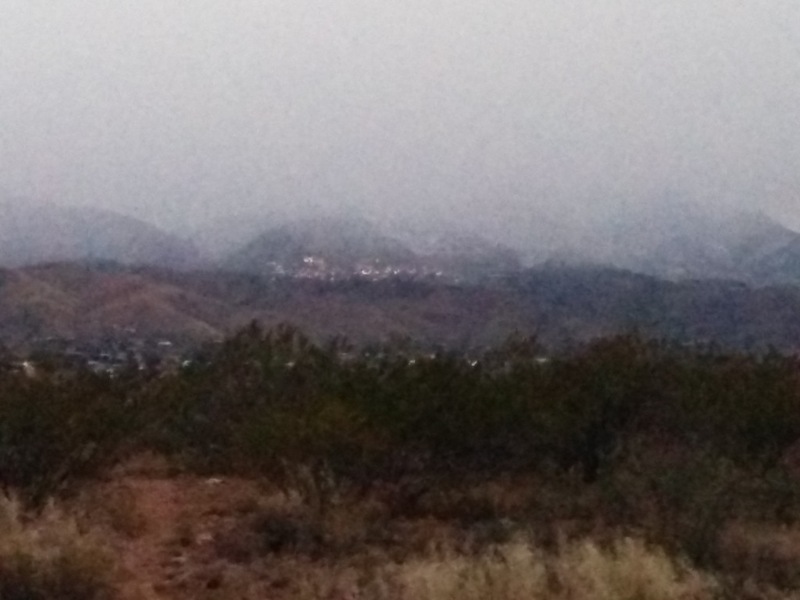 Perched up on the hill over yonder we can see our favorite AZ town, Jerome. As soon as it gets dark its lights twinkle on the side of the otherwise dark hillside. After dinner we clean up, make sure what gear we have left outside will be protected from any rain and head into the shell for the night. As soon as its dark Willow gets agitated and we peak out one of the “windoors” of the shell to see a small fox sniffing around the picnic table. To her usual annoyance when I curtail her mammalian instincts, I restrain Willow from launching herself out said windoor to have a fun game of chase with the floof tail. 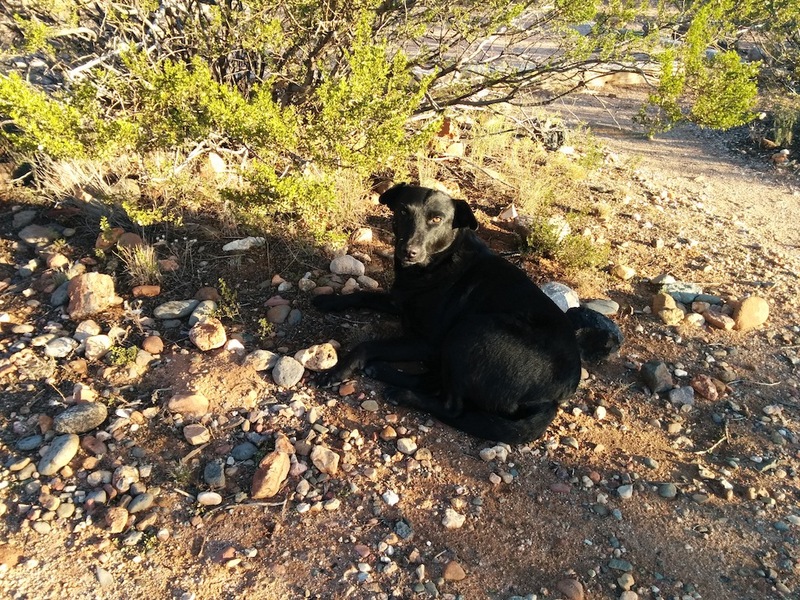 It heard the commotion we made and sped off into the brush surrounding the campsite only to reappear minutes later to finish its reconnoiter and then plop down on the ground under a bush and spend half the night curled up there. Out the shell window panorama. Click for larger version. I let Willow out and she heads directly to that fox spot and gives it the serious sniffing such exotic smells deserve. It’s around 40 deg F out so we bundle up, me in a Pendleton shirt that was my grandfathers underneath my Mountain Hardware insulated shell and dogbreath in her Ruffwear coat. After my morning coffee ritual the sun peaks out and Willow goes to find a sunny patch she can lay and take sun bath which is one her favorite daily rituals, weather permitting. Good and attentive human that I am I put her Ruffwear bed out in a sunny spot but she proceeds to ignore it completely and play chemical warfare with last night’s little floof tail and plops down, on rocks, in the spot the fox curled up in. I call her over to the bed and make her lay down but, nope, right back up and over to that spot. Oh well, she’s a dog and they have their “cute” individual peculiarities. At least she didn’t find and roll in something dead and maggot infested which is another of her oh-so-lovely habits. After it warms up we decide to take a little hike. 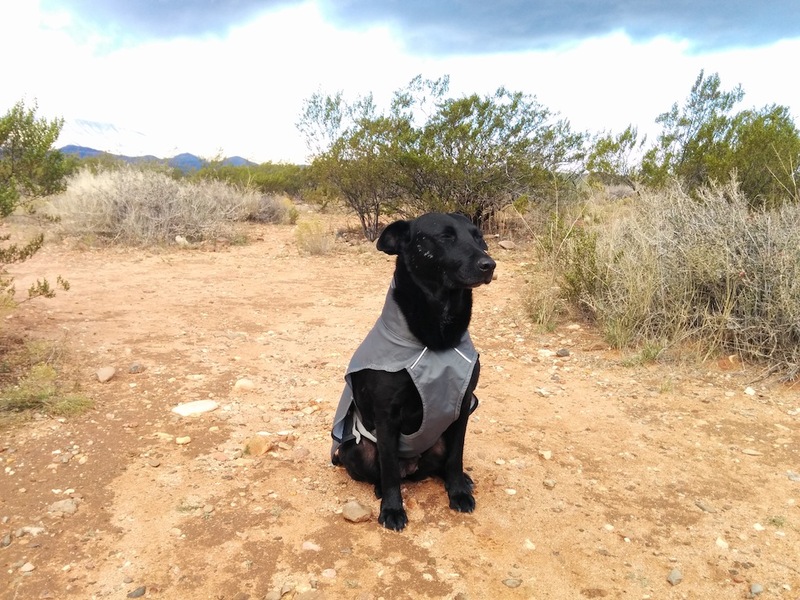 She doesn’t need her warm coat anymore (heck she doesn’t need any coat, she’s just a dog, but she’s my dog) but it looks like more rain so we change into her Ruffwear raincoat. The funny thing about raincoats…they’re great against rain, not so great against those little (and not so little) stabby/spiny things that populate this area. So, Yay, she stays dry but comes back with dozens of little bloody holes in her kinda new jacket trying to lick her wounds through the fabric. 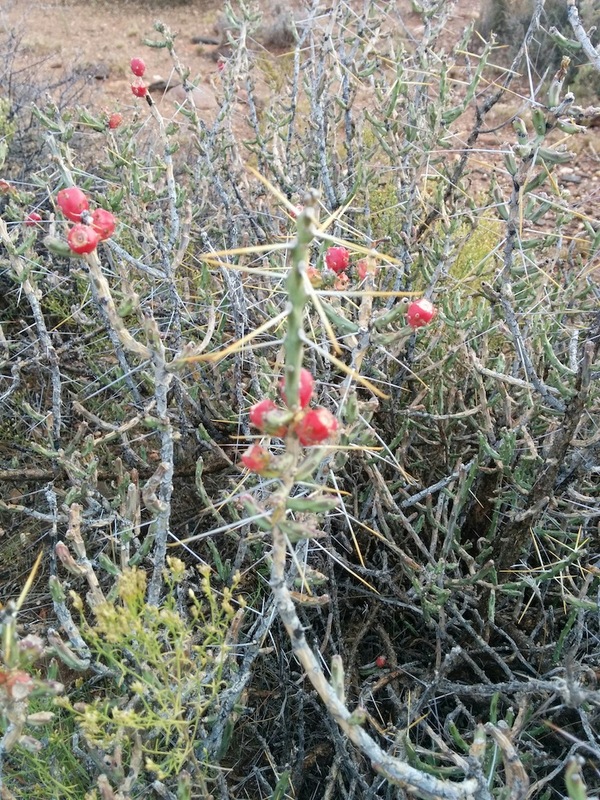 Oh beautiful desert, I love you so but just wish almost all your flora didn’t have such a high self-opinion that they protect themselves by open-carrying bladed weapons. The bonus feature of the hike is that we find someone packed up and moved but forgot a sealed gallon jug of Arizona brand Iced tea under one of the picnic tables in a different area of the campground. Not my usual beverage of choice but I put it in the ARB fridge for some other time. After cleaning and packing up we swing by the camp host’s RV to say “thank you and goodbye,” head into Cottonwood to get some supplies and then head back out on our adventure.